The Number 1 piece of advice for anybody looking to get a healthy Schnauzer - whether it's a Giant, Standard or Miniature Schnauzer - is to buy a properly bred puppy. Far better to spend time choosing a dog which has been well bred than to expend a lot of time and money later on at the vet's when the dog develops hereditary problems caused by poor breeding. As the English upper classes say (in a very posh accent): "There is no substitute for good breeding, darling!" Fortunately, Giant, Standard and Miniature Schnauzers are by and large regarded as healthy and robust dog breeds. They are relatively free of many genetic problems that affect some other purebreeds. Some Miniature Schnauzers do suffer from skin complaints and we have several pages on ths subject, along with comments from our readers on the best way of dealing with them. Other illnesses which can affect some Schnauzers include: diabetes, epilepsy, kidney or bladder stones, Cushings Disease (Minis), hip dysplasia, bloat (Giants) and hypothyroidism. All of these ailments, symptoms and treatments are covered in our ebook The Schnauzer Handbook along with a section on recognising, treatment and dealing with canine cancer. As with any pet, you will probably encounter some health issues during the (hopefully) many years of your dog's life. Here are some of the main subjects relevant to Schnauzer owners. DISCLAIMER: Please note, these articles are intended to give a broad outline of various Schnauzer health issues. 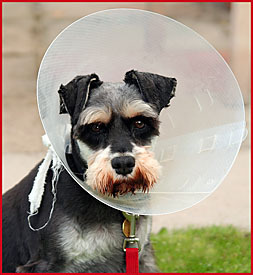 If you think you may have a serious Schnauzer health problem, please consult your veterinarian.